How do I seal and paint Silicone Appliances? Home / Q & A / How do I seal and paint Silicone Appliances? Silicone is a little trickier to paint than latex or foam, but it done right, it can look a lot more realistic. 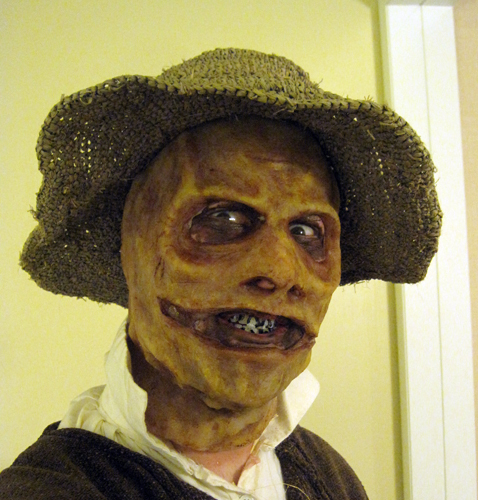 When I did my Twisted Wizard of Oz Scarecrow I used Alcohol based makeup. I purchased them over at Skin Illustrator. They are a little expensive, but they go a long way. You can use alcohol makeup just like watercolors or water based make up, but instead of water, you use 99% alcohol as the solvent. A Smile only a wizard could love. Here is another great video using Smooth On’s Psycho Paint to paint silicone! As for adhering Silicone, check out our Answer page for all our Adhesives and Glues! We also have this older article about our Silicone Products, though a little has changed since we have started to use Pros-Aide for adhering our masks.